Well, as things here at Pentiddy tend to do, time-scales have drifted and the newsletter is now looking more like a seasonal one rather than monthly which actually was the plan originally. Perhaps we should have heeded the inner voice?! This however does gives us the opportunity to be more selective with the items we share and will mean hopefully each newsletter published will be of a better quality with more interesting articles. As you may have noticed I’ve included a contents list above with click-links- I hope you will find this easier to navigate to the parts of the newsletter you are interested in. Please encourage anyone you know who might find these newsletters interesting to view them and to subscribe and share the content. 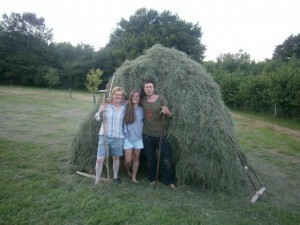 23 years ago Anthony and I, on completion of our Permaculture Design Course, decided to travel around the UK as WWOOF volunteers (World Wide Opportunities on Organic Farms) to see how farms and smallholdings were using the design principles we’d learnt about. 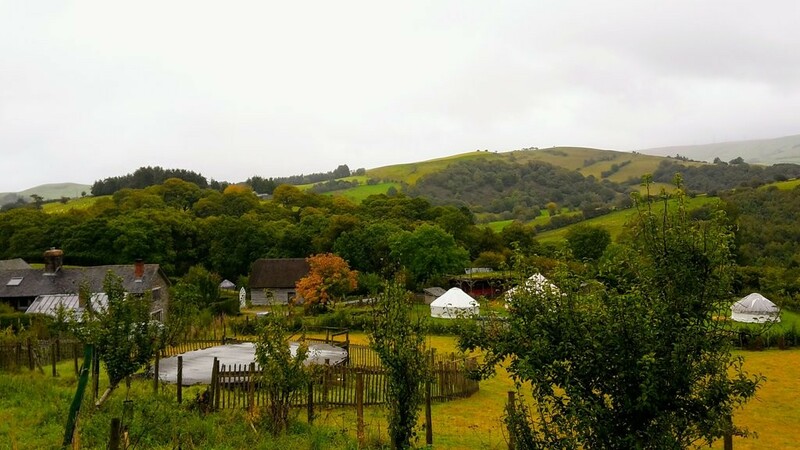 The highlight of our adventure was our visit to Waen Old Farm in Mid Wales. Fran, Kevin and their children gave us such a wonderful bundle of inspiration that we’ve been back numerous times since. They even built us a tiny straw bale house for the start of our honeymoon! For various obvious reasons it’s been quite difficult to get away since buying Pentiddy and Mid-Wales isn’t a place we tend to drive through very often so it’s years since we’ve visited. 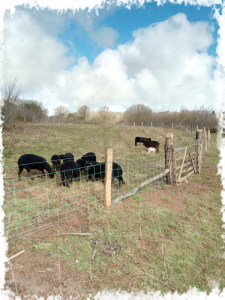 However, we felt that Tim would really appreciate some learning there as they are doing so many interesting things including running a micro-dairy which is of particular interest to him at the moment. So, using that as an excuse, we took the whole family up there for a weekend, leaving Tim to find his own way back after a couple of weeks volunteering. What an amazing place! Since we were last there they’d moved to Old Chapel Farm down the road and have expanded massively in beautiful directions. 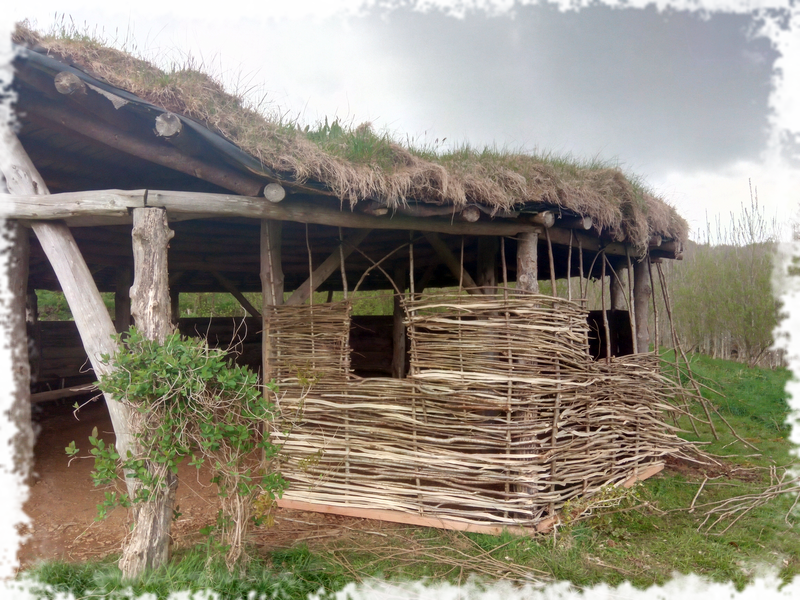 Yet again we had a hugely inspiring time there and marvelled at their ability to gainfully employ 12 volunteers at a time on a whole host of interesting projects including the building of a neolithic settlement. I won’t detail all their activities here as it’s all on their web site (which is well worth a look at if you can’t get to the farm itself!) Needless to say Tim had a great time and has come back fired-up about much more than just the dairy! Elowen and Adeon were also really taken with the place and designed a roundhouse for the woods here as soon as we got home! One of the ideas we have brought away with us is to offer internships. 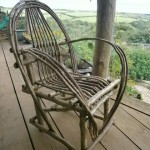 This is something they offer at Old Chapel Farm and is working really well for them. From October 2018 we will be offering 2 places for a 9 month internship here. Participants will have a programme drawn up for their stay detailing their learning about all things sustainable. 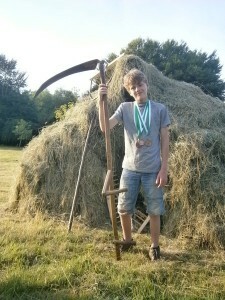 They will have opportunities to learn natural building techniques, basketry, make a chair, learn coppice craft, how to design and build off-grid systems, scything and hay making, no-dig gardening and forest gardening, sheep blade-shearing, and will also receive a small training budget to spend on an external course of their choosing during their stay. If you know anyone who may be interested then please put them in touch. More details next issue. After a long break of hanging up in the workshop and gathering a thick layer of dust- the old machine has been cleaned up, put back together and placed on top of the 12m tower. We finally erected it in August. The raise is always a little bit scary, but it went well with a few extra people around to hold guy-lines and support. The Air 403 is an now an old 400W 12V machine but has had a new set of bearings, and a new set of blades which have been polished to reduce the turbulence and therefore the noise created by their spinning. The hope is this generator will help to top up the batteries in the shorter days of winter, and mean the need to run a petrol generator to charge them and subsequently protect them from damage will be less frequent. 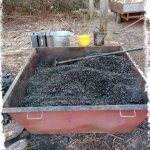 With help from Sarah, one of our amazing volunteers from earlier this year, we have harvested a good quantity of dandelions from the coppice which have been washed, chopped, dried, roasted and ground. I’ve been doing this for years but it’s always been drunk as a special treat as there was never very much of it. It feels luxurious to be having it every morning and to know there are plenty more jars of it in the stores. It’s so tasty, completely free and has numerous health benefits too. A winner! Glorified living roof, tyre wall garden shed – It finally made it’s way to the top of the ‘to do’ list after the Summer and is almost finished. It’s incredibly exciting to think that I may actually have somewhere to put all my garden tools and an under-cover potting bench with strawberries and thyme growing on the roof. It was a great project for using all sorts of materials we had left over from previous jobs: the liner on the roof came from the old pond, the under and over-liners from the swimming pond off-cuts, lath from Bex’s shed build, cladding from a friend’s old shed, and boards for the roof from the house build. Pensilva Tyres were more than happy for us to take as many tyres as we needed to save them from landfill. 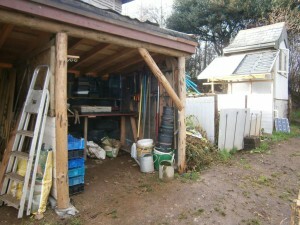 The only problem is that I no longer have any excuse not to be extremely well organised with my gardening! 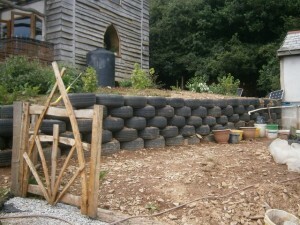 The solar shower, which is part of the same tyre wall construction, is nearly finished but is on hold until the spring but will be ready to use for next summer. Climbing Wall – A request from Adeon has been that we create a climbing wall in the barn where the straw workshop wall was being replaced. 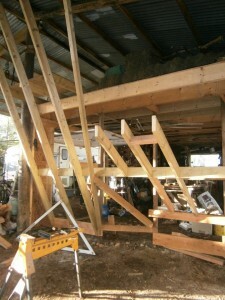 He has put money into the purchase of materials and is helping out with the construction when time allows. The designs has been drawn up by our friend Jessie Carr (who also makes the coffins for us) as she’s a very experienced climber. The design work and some help with the construction will be in exchange for her using it as a practice wall. It will provide many hours of fun and exercise for family and volunteers alike. Anthony is thoroughly enjoying the challenge of the multi-plane angles but is under a little bit of pressure to get it completed before the chair making course later this month…..
On that note, the course on the 25th-26th Nov is fully booked and more requests for places are coming in so we have decided to run another weekend on the 27th – 28th January. See here for more details. Bread oven– Our plan to build a bread oven in the outdoor kitchen will finally become a reality in the spring. Designs are being finalised and materials gathered. 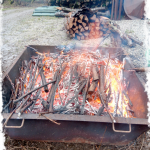 It will be a masonry stove rather than a cob one, and the hope is to to start a routine of cooking once a week… the construction will be documented and shared via this newsletter. Coppice cutting is starting this week and we have extra volunteers lined up until the end of the month to give us a kick-start. 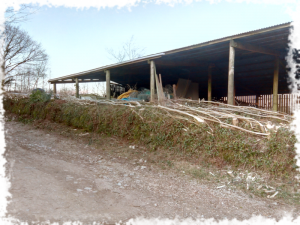 We are cutting the last area of Hazel that is not yet in rotation so it’s not the easiest to work but we already have lots of orders to cut to which feels really positive. Some of you who walk here regularly may have noticed the young ash trees in the community coppice not looking too well. Unfortunately the Forestry Commission have confirmed that now we have Ash dieback (Hymenoscyphus fraxineus) here at Pentiddy. 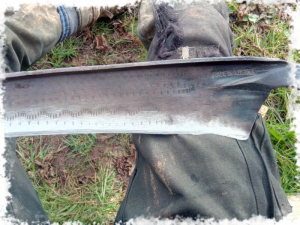 We have yet to make final decisions about how to deal with this as there are so many differing points of view to consider but we will be carrying on thinning out Ash in favour of Oak in the Community Woodland, and assessing the situation as the trees in the coppice come into leaf again (hopefully) in the spring. Following our AGM last week, these are now booked for the 14th Jan, 25th Feb and 25th March. Everyone welcome to help clear paths, sned branches, carry lumber and prune. Please phone if you’re interested in coming. Scrummy soupy cakey lunches provided. Please check out the Calendar tab for more details. 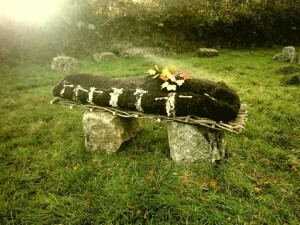 The first Pentiddy Wool Shroud has been purchased and buried here. The product design and development for something seemingly so simple has been astounding but it has proved worth the time and was much admired by funeral directors and attendees alike. Details are on the website here.